Is this the part where Matt Whitaker gets fired? In all the surreal developments today surrounding Special Counsel Robert Mueller’s decision to have Michael Cohen publicly implicate Donald Trump in the Trump Tower Moscow election scandal, one of the most noteworthy aspects was that Mueller did anything at all. Trump installed Matthew Whitaker at Acting Attorney General specifically to hamstring Mueller, yet here was Mueller, pulling off a huge swing at Trump. We don’t know why Matt Whitaker rolled over today, but we do know that he did in fact roll over. Multiple major news outlets reported that Robert Mueller had Rod Rosenstein sign off on the Michael Cohen move, and while Whitaker was informed before it happened, he clearly didn’t stop it from happening. Did he try to stop it and fail? Did he fail to try? We don’t have any way of knowing. But the bottom line is that he utterly, crucially, failed Trump today. Now Donald Trump has a decision to make. His scheme to stop Robert Mueller, by installing Matt Whitaker, is not working. So now what? 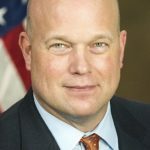 Does Trump give Whitaker a stern talking to about his expectations going forward? Does Trump fire the guy, and try to find someone else to be his new Acting Attorney General? Donald Trump could surely get away with firing Matthew Whitaker, because no one thinks the Whitaker appointment was appropriate or legal anyway. But unless Trump can immediately find some other corrupt lackey to install in his place, Rod Rosenstein would become the new Acting Attorney General, which would only serve to further strengthen Robert Mueller’s position. So will Trump sit tight on an apparent busted hand, or will he fire Whitaker out of spite, knowing it could cost him even more? Stay tuned.